Wakeport (formerly known as Wake Isle under the Pi'illo Kingdom era) is a city area in Mario & Luigi: Dream Team. 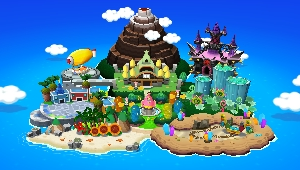 There are many houses and buildings there, and it could be considered one of the most populated areas on Pi'illo Island. Ruins are left around the town to maintain the historic symbols of the town, and is also used as a way to attract tourists. There is a hotel district, a shopping district and an event plaza where the Mad Skillathon takes place. Kylie Koopa resides here as the island photographer, who Mario and Luigi are able to assist in the form of a sidequest if they so chose. The name is a pun on Wayport, Inc., and comes from the term "wake". Mario and Luigi first come here in order to find the tour centre to sign up for the Mount Pajamaja tour, so they can traverse the mountain to where Antasma and Bowser are with the Dream Stone. When they sign up for the tour, the soon learn from Lil' Massif, one of the tour guides, that the tour cannot begin unless his brother and the other tour guide, Big Massif is also present. 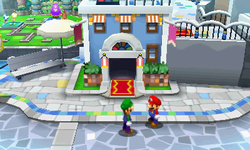 Mario and Luigi embark on a search for Big Massif, and eventually find him sleeping on a Dreampoint. Luigi sleeps near him in the hopes that Mario will arrive in the same Dream World as him, as suggested by Prince Dreambert. Upon being successful in getting Big Massif to wake up and rush over to Lil' Massif, the Massif Bros. tell Mario and Luigi to meet them on Mount Pajamaja to start the tour. Later on, after Mario and Luigi have collected all five Zee Parts, they hurry back to Wakeport in order to find Bedsmith, a Pi'illo with the bed-making skills to create the Ultibed in order for them to meet the Zeekeeper. Mario and Luigi, after arriving into an apparently not populated part of town, find Popple scoping out a Wiggler planning on creating a flower garden there, whom he thinks is a security guard hired by the Pi'illo fanatic of the house he's trying to rob. Under the assumption that Mario and Luigi are also thieves, Popple enrages Wiggler and hinders Mario and Luigi in a battle against him. As soon as Wiggler is defeated, Popple turns against the Bros. and attacks them, also soundly defeated. After the battle, Popple is furious upon learning what they had just fought over, enraging the Wiggler by insulting the flower garden, who then chases Popple, consumed by rage. Popple then states he's leaving this island for good as he runs away, and Mario and Luigi continue through the area to a secret first floor entrance to Pi'illoper's house, the aforementioned Pi'illo fanatic. Pi'illo-per, after seeing the Zee Parts the Bros. have collected, opens the passage to the basement to show his collection of Pi'illo items, eventually showing Bedsmith's pillow, which gets soon slept on by Luigi thanks to Dreambert in order to free Bedsmith. After saving him, Bedsmith states the Bros. must go with him to Somnom Woods in order to access his workshop and build the Ultibed. Mezame Taun Awakening Town. From 目覚める mezameru (awake). Spanish (NOA) Puerto Despuerto Puerto means "port". Despuerto is a portmanteau of "despierto" (awake) and, again, "puerto". Spanish (NOE) Desperta d'Or From "despertador" (alarm clock), also a reference to Marina d'Or, a famous holiday resort in Valencia, Spain. French (NOE) Évolis From "éveil", which means "awakening", and "polis", meaning "city" in Ancient Greek. German Pennemünde From pennen (colloquial term for sleeping) and the suffix -münde, a common suffix for German cities where rivers enter the sea. Italian Risvegliopoli From "risveglio", which means "awakening", and "polis", meaning "city" in Ancient Greek. Ireona Taun Portmanteau of the word 이러나 (ireona), which comes from the phrase 일어나 (ireona), meaning "Wake Up! ", and the word "town". This page was last edited on February 15, 2019, at 22:36.